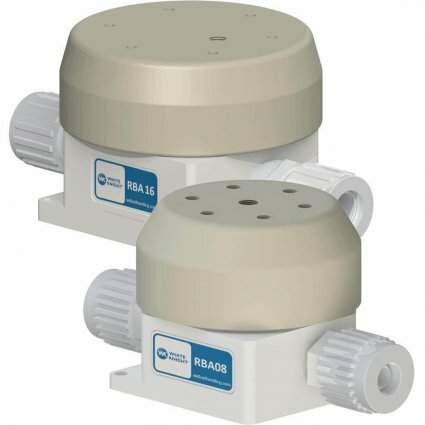 White Knight forward and back-pressure regulators offer remote piloting capability to maintain system pressure for high-purity chemical circulation loops and systems with multiple tool drops or dispense points. They feature fully-swept Teflon® PTFE and PFA flow paths. They operate at up to 100°C (212°F) and 7 Bar (100 psi). They are air-spring loaded, highly accurate, and reduce system pulsation. Pressure regulators are available in 1/2-in, 3/4-in and 1-in models — determined by the connection size and outer diameter of the tubing. The flow through, or inner diameter of the tubing, is 1/8-in smaller than the connection size. 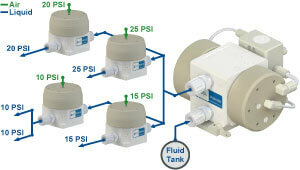 Forward-pressure regulators control downstream fluid pressure. Each discharge pressure needs a regulator. *Flow through is 1/8-in. smaller than fitting size.